The temporomandibular joints (TMJ) are tiny, triangular-shaped connective tissues that attach the jaw to the skull bone. These joints make it possible for you to speak, chew and smile. When damage or strain affects the TMJ, the resultant oral health conditions are known collectively as TMJ dysfunction or just TMD. If you are experiencing jaw pain, inability to fully open and close the mouth or other signs of TMD, call Pelican Landing Dental to schedule your appointment right away. We offer a variety of treatment options to relieve pain and renew the full function of your jaw. 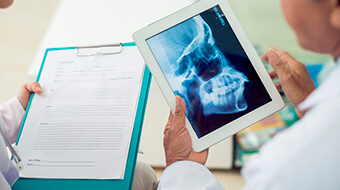 As with other dental care plans, our team will develop your TMD therapy plan utilizing the most conservative options and including more advanced treatment as necessary based on your response. For most patients, we’ll begin TMD therapy by analyzing the jaw muscles as well as how the teeth fit together. Often improper contacts of opposing teeth when biting can lead to TMD symptoms. If such is the case, a simple adjustment of one or more of the biting surfaces may greatly improve symptoms. Additional treatment options may include braces or occlusal splints. In extreme cases, we may even need to recommend surgical treatments. 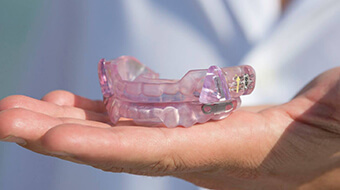 Similar to nightguards crafted to protect teeth for those who experience nighttime teeth grinding and clenching, occlusal splints for TMD sufferers are custom crafted mouth guards that reposition the jaw, so it is in the ideal resting location. This relieves strain on the TMJ during sleep, and reduce unconscious jaw movements that may lead to damage or discomfort. Over time, wearing these splints at night can even help shift the jaw into this ideal position naturally.